Peter was born in Chicago to Paul and Genevieve Katzmark on January 11, 1941. He graduated from Morgan Park High School class of 1958. After serving his country in the U.S. Marines from 1959 to 1963, he attended Southern Illinois University at Carbondale. In 1970 he relocated to California. He holds two patents, and successfully established the Promotional Designs Corporation and presided as CEO of Val-U-Source providing forms for the medical industry. For all practical purposes, Peter had three second names - Golf, Moose, and Charity. From his childhood years Peter was an avid golfer. 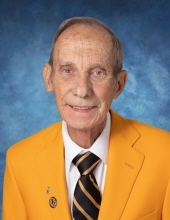 He served on several Moose Lodge boards and served as president for both the Gardena Lodge 2062 and Oceanside Lodge 1325. Peter often took actions to help others. He did these either privately or with the assistance of others. In June of this year, Peter had the Moose Outstanding Member Pilgrim Degree of Merit conferred upon him for his distinguished and meritorious service to the order. Peter is predeceased by his three wives Judith Wlich, Loraine George, and Jean Shaffer, and his older brother, Thaddeus. He is survived by his brothers, John and Paul, and his sisters Jean Collette, and Mary Ellen Doron. Funeral services are being held on Monday, April 1, at 11 AM from St. Francis of Assisi in Vista with the burial to follow at the San Luis Rey Mission. Arrangements are being handled by the Oceanside Mortuary. To send flowers or a remembrance gift to the family of Peter C. Katzmark, please visit our Tribute Store. "Email Address" would like to share the life celebration of Peter C. Katzmark. Click on the "link" to go to share a favorite memory or leave a condolence message for the family.